Tucker is recognised as one of Australia's most prominant and successful artists. His work is represented in the Australian National Collection and all State Galleries as well as the Guggenheim Museum and MOMA, New York, and in Mexico. He won the Australian Women's Weekly Prize in 1959. He produces work in most media although paintings dominate the market. Tucker had no formal art training. He was forced to leave school at 14 to help support his family during the Depression and worked firstly at an advertising agency before joining the commercial artist John Vickery. From 1933 he attended the Victorian Artists' Society evening class three evenings a week for 7 years where he learnt to draw from the model. He was involved with the Angry Penguins and married Joy Hester. In 1947, after the breakdown of the marriage, he went to Japan and then onto continental Europe where he led a bohemian life, painting, exhibiting and doing odd jobs. In 1954 he met Nolan in Rome which stimulated the powerful painting Apocolyptic Horse and pictures of home prompted him to start painting Australia from memory. He was exhibited in the Venice Biennale in 1956 before going to London for 2 years and painting the Thames Series. Winning the Australian Women's Weekly competition enabled him to spend two years in New York where he painted the Manhatten Series and Antipodean Heads. In 1960 MOMA Australia awarded him the Kurt Geiger Award which paid his fare home and for his first solo exhibition in Australia. Since then he has lived in Victoria and married Barbara Bilcock in 1964. Throughout his life Tucker has used bold line in his painting, clashing colour and the most distorted forms to proclaim his vision of man's inhumanity. He is a passsionate critc of man and his society, but his rejection so often expressed visually, measures the depth of his concern. The images are often harsh, designed to shock and although part of their meaning is brutally clear, Tucker has developed an interesting symbolic strata. 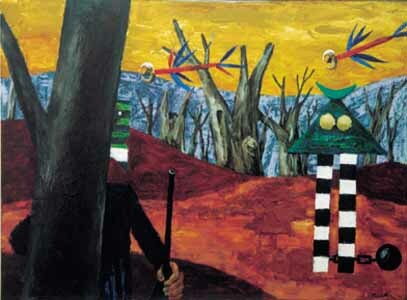 In 1990 the National Gallery of Australia held a major retrospective of Tucker's work. 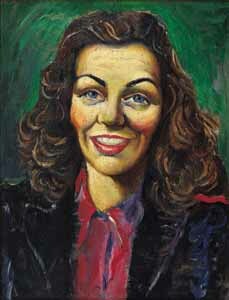 Tucker's paintings of the forties and fifties fetch the highest price and are difficult to find.